The basic equipment for making crêpes includes a ladle, a whisk, a flat spatula, a rubber spatula, a measuring cup, and a two to four quart mixing bowl. An eight to twelve inch diameter non-stick fry pan can be used to make six to eight inch crêpes. Or for larger crêpes, thirteen to sixteen inch crêpe griddles can be used. Some prefer a crêpe batter made with a blender rather than with a whisk. An electric mixer can be used for mixing larger volumes of batter. Flat “flipping” spatula for use with a fry pan or a narrow spatula and wooden trowel for use with a crêpe griddle. 8″ to 12″ nonstick fry pan for six to ten inch diameter crêpes. Or 13″ to 16″ crêpe griddle for thirteen to sixteen inch diameter crêpes. Prepare the crêpe batter by mixing any volume of mix with about the same volume of water. (volume ratio of one to one.) The only exception is our Chocolate mix which only requires about 3/4 cup of water to one cup of mix. Add more or less water to thin or thicken the batter to your preference. Adding more water will make the crêpes thinner. One cup of mix with one cup of water will produce approximately one sixteen inch or four eight inch crêpes. Use a whisk, mixer, or blender to stir the batter thoroughly. Unlike the batter made from raw ingredients, the batter made from Alamarra Professional Crepe Mix does not have lumps that have to be strained out. 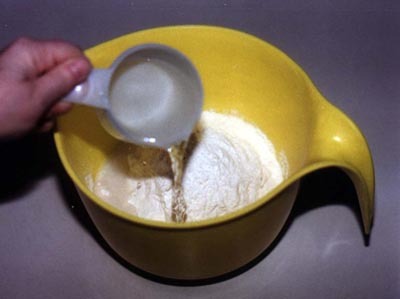 The batter can be used immediately after mixing. If the batter is allowed to sit for an hour or more, some of the butter will rise to the top. The batter will then have to be stirred again to mix in the butter. Some customers prefer to let the refrigerated batter sit overnight in a sealed plastic jug and then shake the jug before using the batter. For large quantities of batter, a mixer may be used as long as the inside of the bowl is scraped with a soft spatula during the mixing process. After mixing, slowly stir the batter with the bottom of a ladle to remove some of the bubbles before using. Prepare the crêpe batter by mixing any volume of mix with the same volume of water (volume ratio of 1 to 1.) Two level cups of Alamarra Crêpe Mix are being added to the mixing bowl to make two 16″, eight 8″, or sixteen 6″ crêpes. Two cups of water are being added to the two cups of Alamarra Crêpe Mix. The thickness of the crêpes can be controlled to some extent by adding a little more or less water. 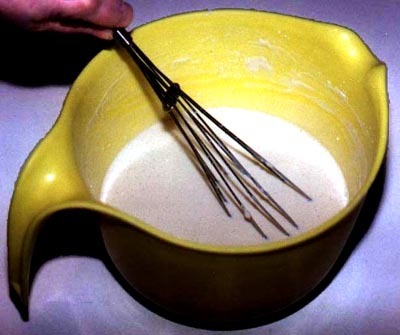 The batter can be stirred with a whisk. Make sure that the mix is thoroughly stirred into the water and that none of the dry mix sticks to the bottom or sides of the bowl. Whisk the batter until it is smooth and there are no lumps. Another way to make the batter is to use a blender. The water and mix should be stirred with a rubber spatula first so that the dry mix does not bridge over the impeller. Run the blender for one minute stopping several times to make sure that all of the dry mix is folded in with the rubber spatula. For mixing larger quantities of batter, an electric mixer should be run on low speed for thirty seconds and then use a soft spatula to blend in the mix clinging to the inside of the mixing bowl. The mixer should be run at a medium speed for about one minute. After mixing the batter, stir it slowly with the ladle or rubber spatula to remove the larger air bubbles. Unlike the batter made from raw ingredients, the batter made from Alamarra mix does not have lumps that have to be strained out. 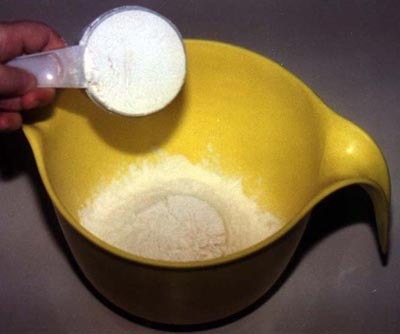 The batter can be used immediately after mixing. If covered and refrigerated, the batter will remain useable for no more than three days. After several hours, the batter should be thoroughly stirred before use because the butter will separate and rise to the top. Preheat a fry pan or a griddle to between 400 and 440 degrees Fahrenheit which is equivalent to 204 to 225 degrees centigrade. A temperature setting nearer 400 degrees will lengthen the cooking time and the crêpe will be crispier and lighter in color. A temperature setting nearer 440 degrees will shorten the cooking time and make a crêpe with a softer center and a darker color. Non stick fry pans that are 1/8″ thick or thicker will more evenly distribute the heat and provide for even browning without burning. Do not use a fry pan that is bowed in the middle. The bottom of the pan should be very flat. If you are using a new fry pan or griddle the surface should be pre-seasoned per the manufacturer’s instructions. The pictures below are of good quality 8″ and 12″ fry pans and both home and commercial crêpe griddles. Preheat an 8″ to 12″ diameter non stick fry pan. The working temperature range for making crêpes is between 400 and 440 degrees Fahrenheit which is equivalent to 204 to 225 degrees centigrade. There is no need to apply butter or oil to a seasoned pan as this will ruin the first crêpe. The pan will be hot enough so that the bottom side of the crêpe reaches a tan color at about the same time that the top side is no longer liquid. An electric griddle will automatically switch on and off to maintain a temperature range within about 20 degrees Fahernheit of the set temperature. A temperature setting nearer 400 degrees will lengthen the cooking time and the crêpe will be crispier and lighter in color. A temperature setting nearer 440 degrees will shorten the cooking time and make a crêpe with a softer center and a darker color. Personal use crêpe griddles usually have a teflon coated surface. Because of the butter in the mix, the teflon surface will not need any cooking oil when using Alamarra crepe mixes. The crepe should come off easily with a non-scratching wood or teflon crepe spatula. Commercial crêpe griddles have a machined steel or cast iron surface and will require that cooking oil be applied to the surface before cooking every three or more crêpes. This cooking oil can be spread with a commercial style crêpe griddle oil applicator. These applicators can be purchased from crêpe griddle suppliers. Some folks use a potato half as an applicator. Keep the applicator or potato (cut end down) in a small dish of oil. With the applicator or the potato half, start at the center of the griddle and wipe the oil around in increasingly larger circles until the entire griddle surface is oiled and cleaned of debris. Some cooking oils such as olive oil can add flavor to the crêpes. Other oils such as rice oil or vegetable oil add little or no flavor. When using a gas range, a medium high setting will provide a near optimum heat to a 12″ pan by the time the batter is made if you use the batter immediately after mixing. Cooking crêpes on an electric range may take a little longer. If the pan is too hot, the resulting crêpes will be rather thick and will brown too deeply. If your first crêpe does not spread evenly, turn the heat down and try again. If the pan is too cold, the top side of the crêpe will take a long time to solidify and the bottom side will not tan or brown adequately. Pour one cup of batter for a 16” crêpe, 1/3 cup for an 8” crêpe, and 1/6 cup for a 6” crêpe. Swirl the pan around or use the wooden trowel on the crêpe griddle to thin and spread the batter. Crêpes made using a trowel will be thinner than those made by swirling. Make sure to keep the trowel wet and clean of batter. When using a fry pan, pour one sixth to one third cup of batter into the fry pan. Tilt the pan around to spread the batter into a crêpe. (One sixth of a cup of batter will produce a 6″ crêpe and one third of a cup will make an 8″ crêpe.) A small 6″ crêpe trowel can also be used to spread the batter in a pan. When using a crêpe griddle for a 13″ or larger crêpe, pour one third to two thirds cup of batter onto the center of the crêpe griddle. A batter applicator can also be used and will eliminate batter drips. Use the wooden trowel to distribute the batter over the entire surface of the crêpe griddle. This will take some practice. Make sure to keep the blade of the trowel in a dish of water and wipe off the bottom of the blade between uses. Develop a technique of starting from the inside and working to the outside to distribute the batter uniformly without spilling it over the edge of the griddle. Always keep the trowel blade in a water tray and clean off the leveling edge before using on the next crêpe. This will prevent making grooves in the next crêpe. If the crêpes appear too thick or “rubbery”, add a little more water to the batter or reduce the temperature and increase the cooking time. To a certain limit, the crepes can be made a little thinner by adding water to the batter. Griddle made crepes will be thinner than pan made crepes that are swirled. This is because the trowel will wipe the batter thinner on the griddle than when swirling the batter in a pan. However, as mentiioned above, you can also use a small crêpe trowel to spread the batter in a pan. If too much water is added to the batter, the batter will pop and boil on the pan or griddle. The resulting crepe can have a lot of holes in it. Making the batter with more water will not make more crêpes. The number of crêpes that can be made is determined by the amount of mix that is used. If the pan or griddle is too hot, the batter will cook too quickly. For pan made crepes, a pan that is too hot will make the crepes thicker and smaller in diameter. Wait about forty seconds or until there is no more liquid batter on top. As the crepe cooks, the batter will solidify on top. When there is no longer liquid batter on top you should work the thin spatula around the perimeter of the crêpe to separate it from the griddle. Then flip the crêpe over. Wait about thirty to forty seconds. As the crêpe cooks, the batter will solidify on top. When there is no longer liquid batter on top you should flip the crêpe with a flat spatula. On the crêpe griddle, wait about thirty to forty seconds. As the crêpe cooks, the batter will solidify on top. When there is no longer liquid batter on top you should work the thin spatula around the perimeter of the crêpe to separate it from the griddle. Then flip the crêpe over. If you’ve never made a crêpe before, start with a smaller crêpe of about six inches in diameter. You’ll find a smaller crêpe is easier to flip and maneuver. Let the other side of the crêpe cook for about 15 seconds in the pan or on the griddle. Be sure not to let the crêpe cook too long, as by this point, most of the moisture has been baked out. Pick up the crêpe from the pan and flip and stack the crêpe onto a plate so that the lighter colored side is face up. Similarly with the crêpes from the griddle, flip and stack the crêpes with the light side up. Stacks of fresh crêpes can be refrigerated for several days or frozen for several weeks as long as the crêpes are individually separated with wax paper and the stack is protected by a moisture barrier such as plastic wrap or a plastic container. Apply fillings and/or toppings on each crêpe and roll or fold for your desired presentation. For some suggested fillings, please see the recipes section. Place a plate over the stack of crêpes and flip the stack so that the darker side is facing up. Eight inch crêpes can be rolled around a filling as shown. Apply two to three tablespoons of filling about two inches in from the edge of each crêpe and roll the filling up in the crêpe. Warm the entrée crêpes and garnish as desired. The large thirteen to sixteen inch crêpes are usually served in one of two ways. The first way is to apply a filling and then fold the crêpe approximately in half over the filling. The second way is to apply the filling and then fold the top, bottom, left, and right edges over the filling to create something like a square envelope. Filled crêpes may be slow baked in an oven at low heat usually less than 250 F or 120 C if the filling requires cooking or you would just like to serve the crêpes warmed. It will be necessary to cover the crêpes during cooking. In addition, you can chill the filled crêpes for serving by placing them in a refrigerator. Be sure to cover them with plastic or put them in a container to prevent them from drying out. Presentation can be important when serving crêpes. A little extra care in folding or positioning the crêpes and applying the toppings or garnishings can make crêpes look much more appealing. Check the recipes or resources sections for additional suggestions for both fillings and toppings.